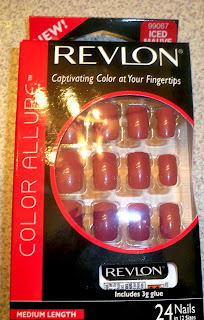 I recently received a package from Revlon to try out some lashes and packs of their press on nails. I was excited to try these out since I know they're accessible to a lot of my readers and this would be a good opportunity for them to try out the products. Let's first start off with the lashes. I had a few styles to try out. Most of them were pretty natural and I also received a dramatic pair of half lashes with a bit of blue in them. One of the more natural pairs...it comes in black brown as well as brown. These ones are the most dramatic of the bunch. I like the blue parts of this lash. I can't wait to try these in a look. -The regular pairs were extremely light weight. When I wore them, I couldn't even tell I had anything on. -The glue that comes with the lashes works really well. -Available at several locations - Target, CVS, many drug stores. -A little difficult to apply. The lashes are so lightweight that the band of the lashes doesn't tend to stay in a curve. When I applied them, they had a tendency to have part of the lashes flip in different directions because they are so light weight. To prevent this, you have to hold one end with your finger and the other with a tweezer so they don't flip out on you. -For someone like myself, the lashes are almost too natural. I didn't get the full lash effect I expected. In sum, these lashes are good for people who really like that natural lash look. The flimsy band make them a bit tricky to apply so watch out if you're a lash beginner. However, they are also very affordable and available in many locations. As a makeup artist, I probably wouldn't purchase them again because I like to stock up on my Ardells. For the everyday makeup wearer though, this is definitely an option. Onto the nails. I've always been a natural nail girl, so when I saw these my interest was piqued. I always felt that the drugstore glue on nails had a bit of a "cheap" stigma to them. However, as a beauty blogger of course I'll give it a go. I was given nails in the medium length. My nail bed is naturally large so I wanted to see if they the sizes to fit me. In the pack, I was surprised at how they have at least 12 sizes to choose from. I received various colors from wine colored to french tip. The first time I applied them, I got major air bubbles. I remedied this by painting over them with a solid color nail polish and top coat (it was actually my boyfriend's idea). Voila! Problem solved. -Lasted over a week (more like 2 weeks) on me with no chipping! -I was able to paint over the nail with my normal nail polish. It still looked great! 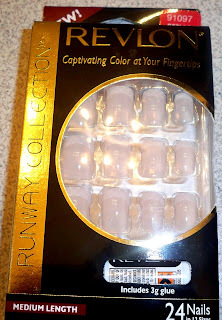 -The sheer/french tip nails showed air bubbles. This could be because I didn't apply them well as a first timer though. -The nails were difficult to remove. Luckily my nails are very strong because I had a little bit of damage...if my nails were on the thinner side it could have been worse. You can see the air bubbles here. This is after I painted a coat of the sheer color from my French Manicure nail polish set. They don't look so bad here. Here's a shot of me where you can see how they are painted. I used a magenta color from Finger Paints - a brand from Sallys. In sum, I love these things! What a cheap alternative to getting acrylics. I would pop these on for a special occasion instead of paying to go to the nail salon. My friends all complimented me on them and didn't even know they were glue ons. I loved how I could have color on my nails for 2 weeks without chipping. I would definitely recommend these. They recommend to change them after 7-10 days. However, I wouldn't really do this on a regular basis because I don't want to risk damaging my nails. If you're up for trying something new, I would definitely recommend these. a good way to remove these nails is to soak them in acetone or polish remover at first. It loosens the glue so they come right off as opposed to just ripping them off. I've been seeing these nails for awhile but always thought they were cheesy and so 80-ish. But, after seeing them on several fingers on several blogs, I'm thinking that they might actually be worth it. I used to love acrylics but they damaged my nails so badly, I'll never do it again. But these bad boys just might do the job. 1. Try to fit the fake nail to your nail before applying. If it's too small, go up to the next size and use a file to shape it down. 2. Make sure your nails are clean before applying. It makes the fakies stick better. Better yet, gently buff your nails, and this will give the glue "grip". 3. Use a sponge cuticle pusher and ease back your cuticles, and apply the glue. When the cuticles relax back out, they will edge the fake nail, and make for a more natural look. Let the glue semi-set before applying the nail. This will lessen the chance of air bubbles. Also press the nails on and down from the top, pushing the nail down and out. This too, should lessen the amount of bubbles. southern gyrl: wow, those are amazing tips! i'm going to try it next time...maybe i'll get less bubbles! Those french manicure nails really do look like your own nails. I wouldn't have known unless you had said they weren't your own nails. You did a really good job of applying. Like you, I'm a natural nail girl but those look like a nice change of pace. i might try these..but they do look kinda tacky in the box. but thanks for doing this blog! they look real and no tacky! good post - i have the nails but haven't tried the lashes... do you have a pic of them on? OOh! 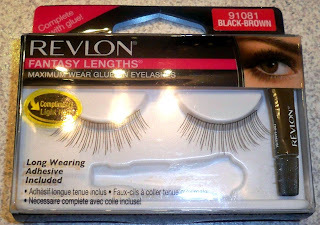 I got the Revlon lashes to review too, haven't tried them yet but we'll see! I still feel comfortable having glue there ya know?? I love the nails on you! I love their lashes. It's so natural looking and light weight. But I know what you mean when you want that full effect look. Overall, their products are pretty decent for the price!!! Have you tried Nailene nails? They look just as natural and beautiful, too. Just thought I'd let you know!! Thanks RenRen! i was wondering about those lashes. i usually wear lashes at night and not during the day, so thanks for the heads up on these. as for the nails, girl i never wear nailpolish let alone get my nails done. i'm so natural. but these would be a great for weddings or evening events. thanks renren! wow! 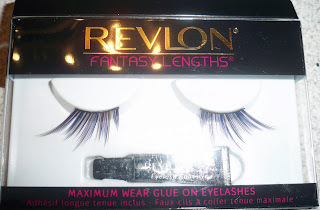 who knew revlon made such crappy lashes! i'm rocking the shisems, they are so awesome. SO awesome! the glue that comes with it is great! have you rocked those yet? New Orleans! Pics and a Makeover! I'm Back! Purple/Pink Prom Makeup! Friday Recap! Off to New Orleans tomorrow! Bridal Consultation - Which Lip Color to Choose?